Christmas is my absolute favorite holiday and time of the year. Did you know Christmas is celebrated totally different in other parts of the world? I stumbled across a great website “Why Christmas?” which includes facts, decoration ideas and everything Christmas related. Christmas Around the World struck my attention and when I followed the link it introduced me to all different customs of Christmas worldwide. I chose Armenia to share. First let’s discuss our traditions. In the United States, the Christmas spirit is shown by decorating houses with stringed lights, reindeer and snowman statues, wreaths on the doors, Santa Claus and of course a big Christmas tree. We also traditionally prepare ham or turkey, sweet sausage, cabbage, soups and even lasagna as main dishes. Christmas is also observed as a religious holiday, thus meaning schools are closed, post offices, restaurants, food stores and malls, and pretty much any other place else you can think of. Most families go to church the morning of Christmas, and then return home to open gifts. On Christmas Eve one gift is opened, which is a tradition in my household. Christmas is a time to thank Jesus for his blessings and celebrate his birthday, but also a family-oriented holiday in the U.S. Other countries that share most of the same customs we follow on Christmas are England, France, Italy, Holland, Poland and Mexico. Armenian’s celebrate Christmas a little different. January 6th is Christmas Day. The Armenian Apostolic Church celebrates Epiphany, the revelation of Jesus being God’s son. Currently, the meaning of the Epiphany celebration has transformed to the remembrance of the Wise Men and celebration of the baptism. Food plays a large role in Armenian Christmas trees and ornamentation. Fruits are often hung on trees along with the white doves that symbolize peace and golden bows for decoration. Ribbons in the three colors of the Armenian flag also garland the Christmas tree — red for the blood that has been shed for the country, orange for the rich land, and blue for the sky that watches over it. 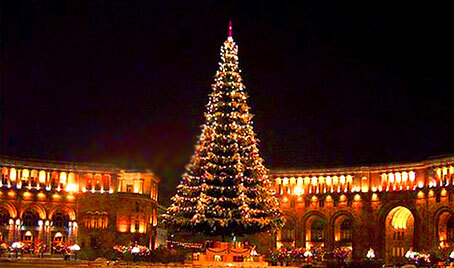 In the beginning of December, a huge Christmas tree is put up in Armenia’s capital, Yerevan, in Republic Square. Armenian’s fast the week before Christmas and prepare a light dinner for Christmas Eve. The Christmas Eve dinner is called khetum Rice, fish, green chard and chick peas, yogurt soup, and desserts such as dried fruits and nuts, including rojik (whole shelled walnuts threaded on a string and encased in grape jelly), bastukh (a paper-like dessert made of grape jelly, cornstarch and flour) are the normal “light” dishes for this night. Christmas is considered more of a religious holiday in Armenia before anything but family dinner and exchanging of presents are still traditions. A more substantial dinner is cooked this night and includes all of the traditional holiday foods Anooshaboor (Armenian Christmas pudding), Khozee bood (glazed ham) and dried fruits. Armenia’s stop by each other’s houses on Christmas too, whether you know each other personally or not, so every household is usually stocked with extra desserts to be ready for the party! Since Christmas Day is mostly for religious celebration, Santa Claus, referred to as Gaghant Baba / Kaghand Papa, arrives on New Year’s Eve (December 31st). Visit “Why Christmas?” to learn more about different countries Christmas traditions.